Sony uses an admirable, consumer-friendly system of labeling their TV models. Currently, their top of the line series is the XBR HX950, which offers - for a premium price - all the features and high-end display technology that you could hope for in a 2012 LED TV. One rung below the 950 series is the HX850, which, as you would expect, replaces some of the HX950's top-notch features with tech that is still excellent. In fact, many viewers may never see the difference even if the TVs were side-by-side. The model in this review is the HX750, which occupies the "Good" spot in this Good, Better, Best hierarchy. But with the HX750, Good is damn good. In fact, the 46HX750 that I am reviewing is a gem of a TV with great picture quality. Would I prefer the incremental video performance boosts of the HX850 or HX950? You betcha! But the accountant in me would be proud of my money saving decision to go with the HX750. The Sony KDL-46HX750 Dynamic Edge-lit LED technology (with frame dimming) produces deep blacks, not on par with the HX950's full-array local dimming system, but the picture quality of this 750 is excellent. The audio quality from the integrated speakers is above average, but the TV will look better with a dedicated speaker system. 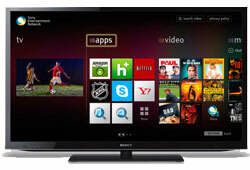 Sony supplies an armful of Internet content providers like Netflix and YouTube and the TV has a built-in Wi-Fi adapter. If you are a 3D fan, the HX750 is 3D capable but you will need to purchase separately the pricy active shutter 3D glasses. With quite usable default picture modes and an on-screen manual, the Sony KDL-46HX750 is fairly easy to set up. That doesn't mean that it won't take some time to explore all the features and Internet content providers. At the time of this review, you could purchase the Sony KDL-46HX750 on the Sony site for $1000, marked down from its MSRP of $1600. But nowadays, you can buy 60" LED TVs for $1000. Though from what I have seen, the picture quality of the 46HX750 makes it a good value (at $1000) even when compared with its bigger-sized, equally-priced competition. I've always been a Vizio fan myself. I've been through a number of TVs over the years because I usually keep them on all the time. Its always hard to pick a new TV because of all the different specs and features that are constantly coming out . Pricing for what features the TV has is a big issue I find myself struggling with. One thing I always do is check reviews and pricing on sites like www.tvrevs.com or other sources and check out some reviews on the brand your thinking about getting. Just my two cents.